Hi everyone! Remember me? It's been a while since I've posted a menu. I haven't posted since June 5th. It's been a nice little break. My kids were still in school until the 3rd week of June and I barely felt like cooking with all the busy-ness. We just got back from nice trip to Utah to visit family. We visited 22 of our favorite people (parents, siblings, nieces and nephews/cousins, etc.). It was lots of fun and involved lots of food. I went grocery shopping three times during the week that I was there. 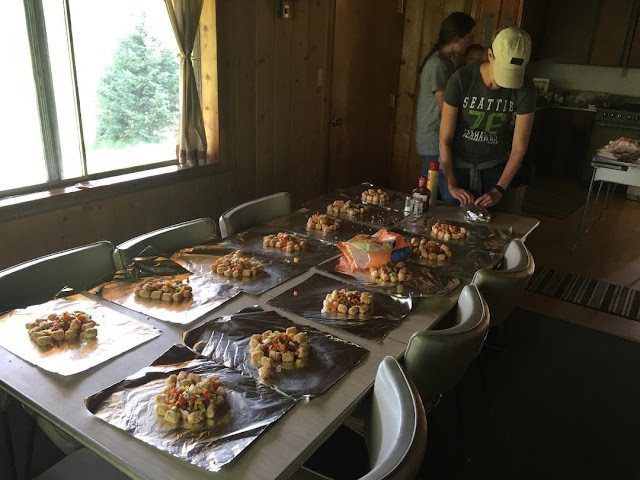 One of my favorite parts of vacationing is preparing food with other people, instead of me being in the kitchen by myself. 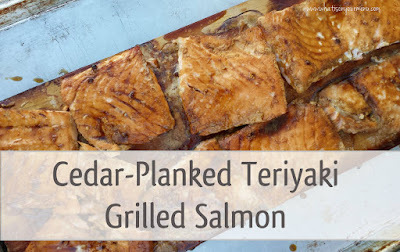 On the 4th of July I contributed to our BBQ by grilling up a ton of cedar-planked teryaki salmon. It made me smile when one of my nephews only had salmon on his plate. Not even any chips! We spent a few days at my dad's family cabin. It's one of my favorite places. It reminds me so much of my grandma. Her old furniture is there, her dishes are in the cupboards, and the toys that I grew up with in her toy room are in the toy box. She passed away when I was 16 and I grew up with her living right up the street from me, with a field in between us. 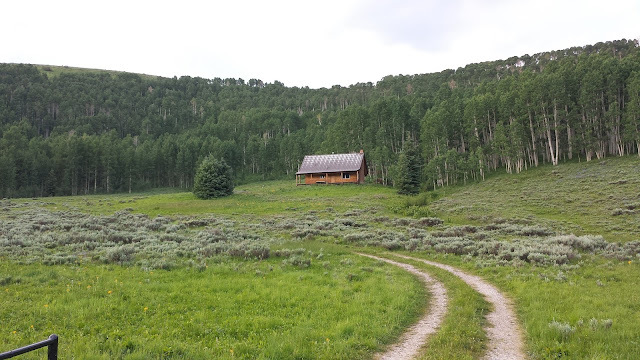 The cabin doesn't have electricity, or cell service (yay!). Everything is powered by propane (fridge, heater, stove, and tiny lights) and I love it! I love that my kids get to experience the cabin pretty much exactly how I did when I was growing up. Anyway...my parents, sister, sister-in-law and her cute baby came up for the day. We whipped out 14 BBQ Chicken tinfoil dinners to cook on the fire. We ended up having to finish some of them in the oven since 14 is a bit too many for the fire. The coals didn't stay hot long enough since they were so spread out. I forgot to bring honey to drizzle over the tinfoil dinners before wrapping them up, so I mixed some maple syrup with the BBQ sauce and it was delicious! 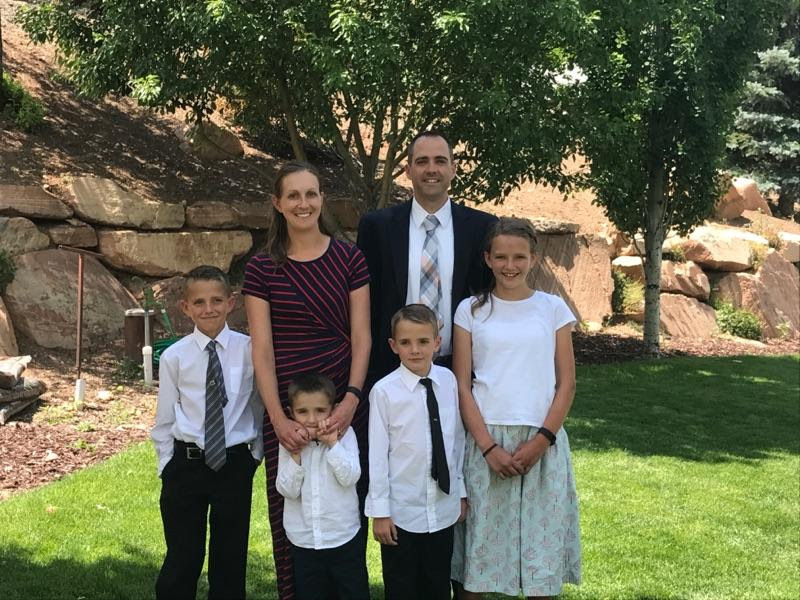 The most special part of our trip was on Sunday when my son was able to be baptized a member of the Church of Jesus Christ of Latter-day Saints. It was his 8th birthday and we decided to let him be baptized in Utah instead of at our church in Washington so family could attend easier. It was a really neat experience. He is such a great kid and tries so hard to be good (most of the time) and knew exactly what it means to be baptized and receive the gift of the Holy Ghost. It was one of those sweet pay-off parenting days, for sure! We got to have a big family dinner after his baptism. My sister-in-law, Maggie, worked some magic with her Traeger smoker and made brisket and ribs. 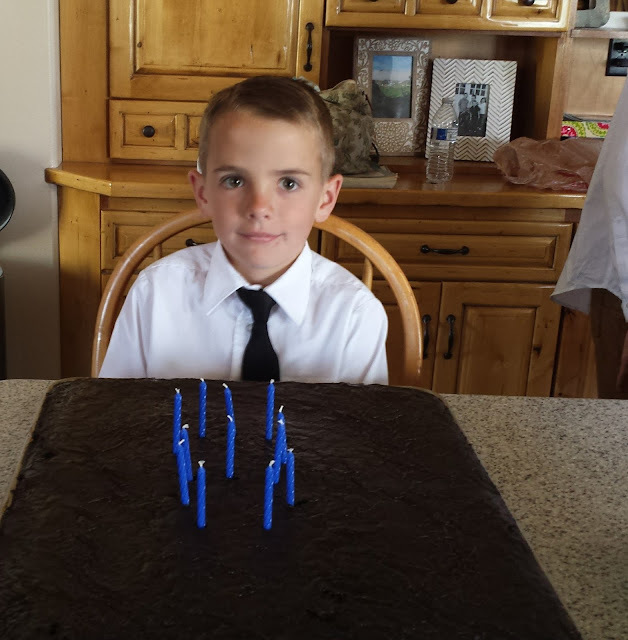 I made funeral potatoes, spinach salad, easy crescent rolls, and Texas sheet cake for the birthday boy's cake. We used dark chocolate cocoa for the cake it was divine! The boys, begged for seconds, and the rest of us were sad when it was gone. I've been encouraging my kids to experiment in the kitchen. It's been fun to see them make yummy things! Anyway....here is my menu for the week even though it's almost over. Ok! Did you get all that? The last month and a half have been busy, busy but full of good company, hard work and yummy food. What about you? What are you favorite summer meals? Feel free to share. I love it when you do!